WYDE Voice conference bridges are designed on the “Datacenter in a box” concept, which means that they can be deployed quickly with minimal technical resource. The platform is virtually “plug and play”. “Datacenter in a box” deployment consists of installing the specified conference hardware which is then configured for use in that conferencing telephony communications solution. 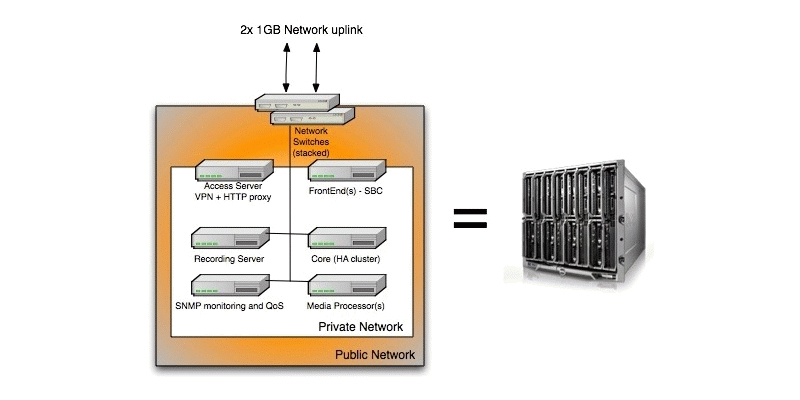 The primary hardware that is being used is WYDE platforms – the SB-HD1000 and the SB-HD10000 conferencing bridges. WYDE conference bridges are designed to be attached to your network in appliance-fashion. They are, for all intents and purposes, servers that can be installed and managed as such. We have deployed the platform in multiple countries to date and the average time taken from placement of an order to a fully functional conference service is typically less than one month for the SB-1,000 and less than two months for the SB-10,000. View our Product Page for more information. Michael is a Technical Writer for Wydevoice and has vast experience in hardware telephony. If you have any specific questions related to Wydevoice technology, please contact us at (866) 508-9020. We host and support high quality voice conferencing ecosystems for global businesses with thousands of users, international educational institutions and even mom-and-pop shops. We do it all in HD. Wyde Voice develops and manufactures the most advanced audio conferencing bridges on the planet. We scale higher than other options (up to 10,000 concurrent users), support the widest range of HD voice codecs and integrate easily with legacy billing and authentication infrastructures. WydeVoice © Copyright 2017. All Rights Reserved.